Organisers of Reggae Sumfest will be restricting the type of chairs patrons will be allowed to take to the venue for the Friday and Saturday night live shows. The 26th staging of the world-renowned music festival will be held at Catherine Hall entertainment complex on July 20 and 21. According to the Sumfest website, “ticket holders may not bring in chairs to the festival, due to safety issues and regulations”. However, in a telephone interview with THE STAR, Sumfest director and deputy chairman Robert Russell said that the restrictions will be for seats of a certain size. The website said the new restrictions will affect the last two nights and is established to ensure the safety of patrons, and comes at a time when a record number of reggae music fans is projected to attend. Sizzla, Popcaan, Aidonia, Bounty Killer, Harry Toddla, Agent Sasco, Shane O, Tosh Alexander, Tommy Lee, Dance Xpressionz, Rygin King, Govana and Stonebwoy (Ghana) are among the acts scheduled to perform on Friday’s dancehall night. The legendary Beres Hammond, Damian Marley, Capleton, Cham, Fantan Mojah, J Boog, Jah Dore, Jesse Royal, Raging Fyah, Naomi Cowan and Empress Ayeola are among those billed for Saturday night. On Sunday, July 8, Grace Kitchens in conjunction with Downsound Entertainment previewed some of the items that the brand will serve in the food hall at Reggae Sumfest between July 15 and 22. Executed by Christian Sweeney, executive chef, Fuzion Food Services, the menu showcased some of Grace’s best items. The Red Stripe bar was stocked with sorrel, lemon paradise, light and original Red Stripe beers; Grace coconut water, Tropical Rhythms, D&G sodas and Catherine’s Peak water. Guests mingled in the courtyard of Downsound HQ while noshing on an array of fare. On offer was a selection of pasta, meat, fish and side dishes. There were Grace tuna and sweetcorn pasta, Grace jerk chicken pasta and Grace jerk veggie pasta. Sweet and spicy buffalo wings, jerk pan hot dogs and jerk stuffed whole snapper. Rounding out the meal were butter almond festivals and Scotch bonnet buttered sweet corn. The pasta had an expertly made béchamel — it was creamy, had a mild jerk flavour and the veggies and the chicken were fresh and well-cooked. The hot dogs (marinated in jerk seasoning) were very appetising but would have been a sure knockout were the buns toasted or steamed. The wings were very yummy and Thursday Food broke all the rules of etiquette by licking its fingers; they were that good. The stuffed snapper, roasted whole in aluminium foil, was filled with fresh herbs, earthy callaloo and al dente carrots. However, it would have benefited from being served fresh off the grill as the butter began to congeal in the foil wrapper. The corn was flavourful and slick with butter. And, just when you thought you’ve had every variation of festival there is, Chef Sweeney turns up with a buttered almond version. Nuanced with nutty flavour and perfectly fried, you’ll want the recipe. As a parting gift, guests were given an insulated cup and a VIP pass that entitles them to unlimited soup and one full meal from Grace on any Sumfest night of their choosing. This sneak peek of Grace’s Sumfest food offerings along with ice-cold Red Stripe was a good way to spend a Sunday afternoon. The Reggae Sumfest small stage has introduced a few of the fiercest names in reggae and dancehall to a wide music-loving audience and has even acted as the platform to ‘buss big’. The list includes reggae entertainers Warrior King, Bushman and Shenseea, who have graduated to the main stage following their appearances on the small stage. Its reputation for promoting talents is highly revered among the fraternity of emerging artistes despite the early placements and short performance time it offers. According to emerging artist D’Yani, who is performing on Reggae Sumfest Reggae Night (night two), an opportunity, no matter how small is at the end of the day, a good opportunity. “The platform is there to explore. As a young artiste, you must use, every minute to deliver a good solid set that will leave a lasting impact,” he told The Gleaner. The Sad Story singer was recognised by the Reggae Sumfest team while performing on the Fame 95FM Road Party. Dancehall singjay Kim Nain shared the same sentiment. “It is the beginning for another part of the musical journeys young artistes are taking,” she said. Meanwhile, Imeru Tafari, 24-year-old son of Queen Ifrica and fast-rising reggae artiste, sees the stage show like any other event where he is given time to perform. “It could be a Reggae Sumfest, Rebel Salute or smaller event – to me, it is about showing not only my talent, but most importantly, sharing the message of positivity and righteousness. For all the shows, it is the same,” he said. Imeru Tafari is cognisant that he will only receive five minutes to perform his set but nonchalantly answered, “It’s not a big problem. Two song can still deliver in that time.” He says his true satisfaction comes from being able to share the lyrics. “The Reggae Sumfest stage is definitely one that will expose me to bigger platforms being an international show, and I am hoping it brings me across the world,” he added. “It is my second time performing. The first time, my mother called me on stage to perform with her. There I got the chance to sing Damian ‘Jr Gong’ Marley’s verse from their collaboration, Trueversation,” he recalled. Other young reggae performers include Abatau (son of Tony Rebel), Naomi Cowan, and Stushie, and among the emerging dancehall acts Rygin King and Vanzo. Jesse Royal is ready for Reggae Sumfest 2018! File Police on foot patrol. Organisers of Reggae Sumfest say there will not be any major increase in the number of police personnel for its Friday and Saturday night shows at the Catherine Hall Stadium this year. According to Russell, the Area One police headquarters usually handles the police deployment with approximately 130 per night, who are selected from the four parishes. “Anywhere from 100 to 150 security officers will be deployed at the venue per night,” he said. For the events prior to the two main nights, about 20 police officers will be assigned to each. The one-week reggae and dancehall music festival is set to unfold in the western resort city of Montego Bay from July 15 to 21. It will be held under the extended state of public emergency, which organisers had earlier indicated would not affect the regular early morning closing hours of the live shows. Reggae Sumfest is much more than just the entertainment and limelight for many people like Hermine Shaw of St James. Shaw will tell you that the food is also equally one of the biggest highlights of the ‘Greatest Reggae Show on Earth’. For the past 26 years, Shaw has been at the helm of homestyle cooking on the main nights of the summer festival held at Catherine Hall in Montego Bay. Her food stall, branded under the household name ‘Hermine Homestyle’, is a godsend for the thousands of local and international patrons who come out each year looking to chow down on Jamaican mouthwatering dishes. “My cooking is homestyle, and I do everything like rice and peas, brown stew, curry stew peas, oxtail, ackee and salt fish, salt mackerel, soup, shrimp, conch, and more,” Shaw told the WESTERN STAR. “People look forward to me every year because they know my stall and know that I cook nothing but good and tasty food. I have people from Canada that come every year for them oxtail,” she added. Shaw explained that last year’s staging was one of the best as she had more customers than she was able to provide service for. No doubt that she is now looking forward to the upcoming staging, and she has brought in her son in to operate a second stall. “I came to Reggae Sumfest off of Sunsplash, and over the years until now, I have always lived good with the promoters. I work with their system and do my business, and I was able to put both my daughter and son through school and college, assist my grandchildren …,” said Shaw, who is also a taxi operator. motivates me, and I plan for it every year. I appreciate the promoters, and I thank them very much. I thank them a lot for what they have done for me and what I do for myself,” she added. As the iconic Reggae Sumfest prepares for it’s 27th staging, it will be introducing a new layout and more activities for patrons between sets. This includes a food court by Grace Foods. The brand partnered with long time sponsor Red Stripe to present an exclusive tasting party on Sunday as a preview for the festival. Guests were greeted to a well-decorated venue, music and food, food and more food as the company crafted a variety of pasta dishes, wings, steamed fish and more to wet the appetites of veteran Sumfest-goers. The food was complemented by a fully loaded Red Stripe bar stocked with beers and an assortment of Grace lifestylee drinks. 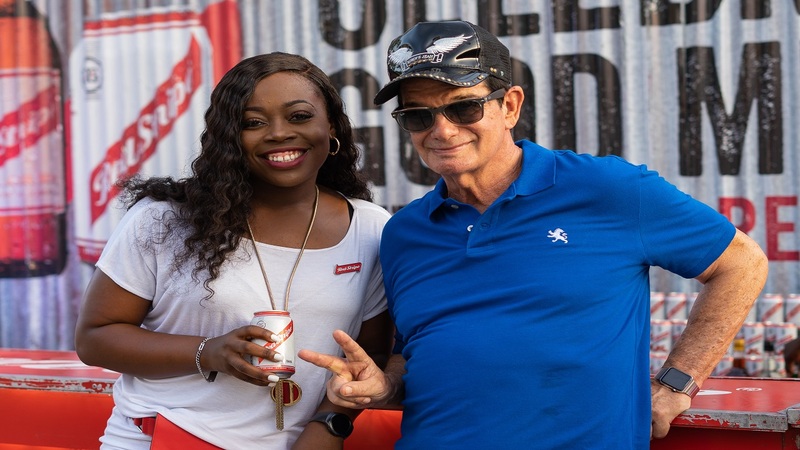 Red Stripe will once again be a presenting sponsor for Reggae Sumfest, which will take place in Montego Bay from Sunday, July 15th to Saturday, July 21st. It is no doubt that Jamaica has made a huge impact on the world through their distinguished reggae music— and Reggae Sumfest has definitely had much to do with this influence. As the premier reggae festival on the planet and the biggest party in Jamaica, Reggae Sumfest is an entire week of head bobbin´, drum beatin´, hip-swayin´ fun. Beyond just reggae, however, Sumfest also explores the musical worlds of R&B and hip hop. Over the years, Beyonce, R. Kelly, Jay-Z, Ludacris, Alicia Keys, Usher, Lil´Wayne, 50 Cent, Mary J. Blige, Kanye West, and many other huge international sensations have rocked the stages of Sumfest. Although the festival is known for attracting elite musicians from all over the world, it also does an outstanding job of shining a bright light on their local legends, such as Damian and Stephen Marley, The Mighty Diamonds, and Freddie McGregor. The musical lineup for 2017 was just as impressive, starring the likes of Alkaline, Sean Paul, Tifa, Queen Ifrica, Sean Kingston, Mavado, and many, many more. As in the last 2 years, Spice the queen is also starring the Sumfest lineup 2018. The other reggae artists confirmed are: Popcaan, Sizzla, Beres Hammond, Capleton, Maxi Priest. See the full lineups for the weekend below! Through all of this, it is important to note that Reggae Sumfest is much more than just a music festival. It is an affectionate gathering in one of the most tropically delightful places on Earth, celebrating authentic Jamaican culture, and raising the vibrations of peace and love high enough for the world to feel. While many people attend the festival for the music, it is the energy of the island that swims in their veins for a lifetime, causing them to return year after year. It’s time to get down; to get down to reggae in the home of gettin’ down to reggae— Jamaica. It’s time to light up, sway in unison to rhythmic reggae, throw your hands up to the sky, and march to the anthem of “One Love” at this year’s Reggae Sumfest. KINGSTON, Jamaica – Jamaica’s iconic music festival Reggae Sumfest has been expanded to eight days this year, according to Downsound Entertainment, festival owners since 2016. Thousands of reggae and dancehall fans from across the world will be descending on the island to attend the 26th staging of the “Greatest Reggae Show on Earth,” from July 15 – 22 in Montego Bay. This year’s festival has attracted some of the genre’s biggest names, including Damian ‘Jr. Gong’ Marley, Beres Hammond, Capleton, Bounty Killer, I-Octane, Spice and Raging Fyah. Patrons are in for an extra treat this year as for the first time, a Latin flavor has been added with Mexican reggae artist Jah Fabio set to perform on Friday night. With the festival dates fast approaching, hotels are filling up quickly with many already sold out. Other partners offering special Reggae Sumfest packages include: Deja All-Inclusive Resort, Grand Palladium Jamaica & Lady Hamilton Resorts & Spa, Holiday Inn Resort, RIU Hotels & Resorts, Round Hill Hotel & Villas, Sandals Resorts, Sea Gardens Beach Resort and The Wexford Hotel.